Green means go in Toss Up Dice. Roll the 10 colored dice and follow the rules of a traffic stoplight. Green dice are good. Yellow dice are a warning and red dice will bring your momentum to a screeching halt. Oh, and you'll lose your points too! My lovely wife and I sat down to play this game one evening. We found the dice game instructions easy to follow. The multi-colored 6-sided dice, with green-red-yellow sides, help keep it simple. In fact, we both thought that kids, maybe as young as 5, would find it fun to play. They can practice math by counting the green colored dice and adding numbers, if they're old enough. The rules state that the game be played by ages 8 and up, but I'd consider that more of a recommendation. The Toss Up Dice game makes an ideal travel game for families, especially with a handy plastic carrying case for the game's 10 dice. You'll win this game by becoming the player with the highest score over 100 points at the end of the game. 1. You start by rolling 10 dice. 2. You score a point each time a dice rolled turns up green. 3. Put the green ones aside and re-roll the rest. - You choose to stop, add up your points and pass the dice. -You roll 1 (or more) red dice AND NO green dice, which means you lose all earned points for that round. A player may stop rolling at any time and keep any points earned for that round. The points are written on the score sheet and you cannot lose them once recorded there. When one player passes the 100 point total, every other player has one chance to roll the dice and score higher to beat that total. You may download a free dice game score sheet to use while playing this game. When we played the game, we discovered that our chances of all 10 eventually coming up green are very good. I don't mean we rolled 10 green dice in one throw. We're not that good. Why are the odds in your favor? 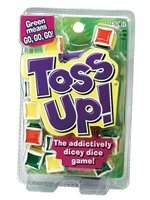 The Toss Up Dice each have 3 green sides, 2 yellow sides and 1 red side. That means, only 1 side in 6 actually may actually end your turn. However, even if the red side appears on 1 die, you're safe as long as another die shows green. The 1 in 6 odds only apply when you're down to rolling 1 die. That's when the dreaded red stopped us a few times. If you like Toss Up Dice, I'll roll the dice and say that you'd like these games too: Greed (also called Zilch) challenges you to know when to stop rolling or risk losing all your points. The farkle dice game involves similar rules and is equally fun and challenging. The Left, Right, Center dice game offers another fast paced game with easy to learn rules. The LCR dice game can provide an evening of entertainment for a group of friends.